Bacoff Cleaning Products are formulated with natural ingredients. This natural hand wash is equally tough on dirt like any chemical one yet is gentle on hands. 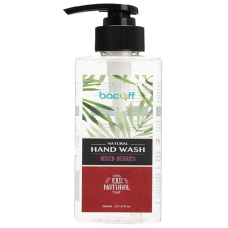 Their natural hand wash is infused with mixed berries essential oils and botanical glycerin to create a soothing smell while leaving skin feeling luxuriously soft and smooth. Bacoff cleaning supplies in Singapore are 100% Natural, Non-toxic & non-hazardous, Vegan and Cruelty free. Hand Wash : <Click ME>Hand Sanitiser : <Click Me>..
Lather in this rich and luxurious hand wash made formulated with natural ingredients. Infused with..